Who would have thought that the world's oldest church still in use today stands on a volcanic island way up in the North Atlantic. 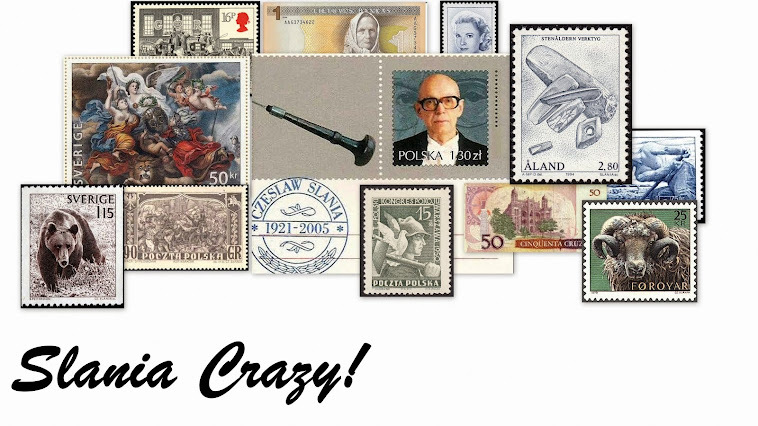 And this very church has a connection with the stamp engraving guru, Czeslaw Slania. 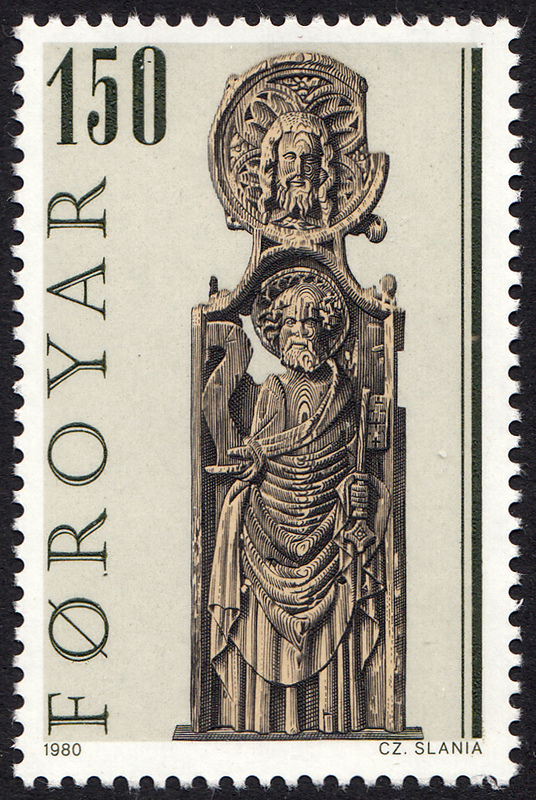 That church is Saint Olav's, and its origins date to the 12th Century. The church is located in the village of Kirkjubøur on the island of Streymoy in the Faroe Islands. 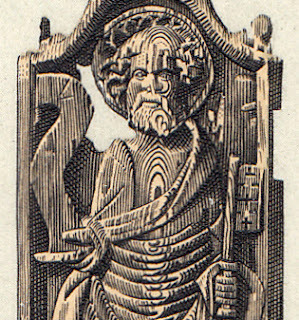 So what is the connection between Czeslaw Slania and Saint Olav's. Well, pull up a pew and I shall tell you (the bad joke will become apparent in a minute). It all started back in medieval times when it was decided it would be nice to decorate the ends of the church pews of Saint Olav's with elaborate carvings. 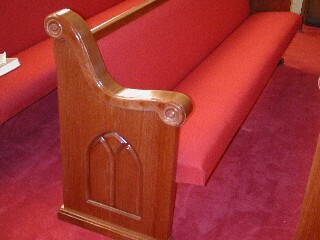 Pews are the long benches found in churches upon which parishioners sit. 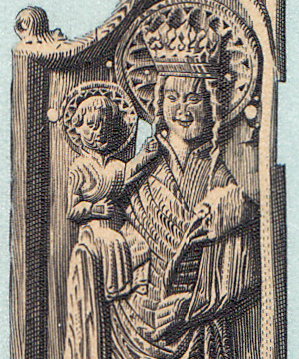 The ends, generally wooden, are often decorated. Below is an example. 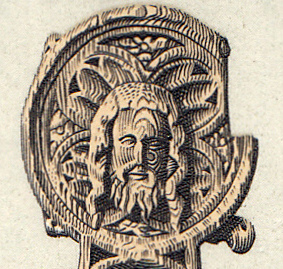 Take this type of decoration and multiply it by a factor of 100 and you may start getting close to the beautifully carved pew ends that were housed in Saint Olav's. Below is one of the pews, all of which are now located in the National Museum of the Faroe Islands. 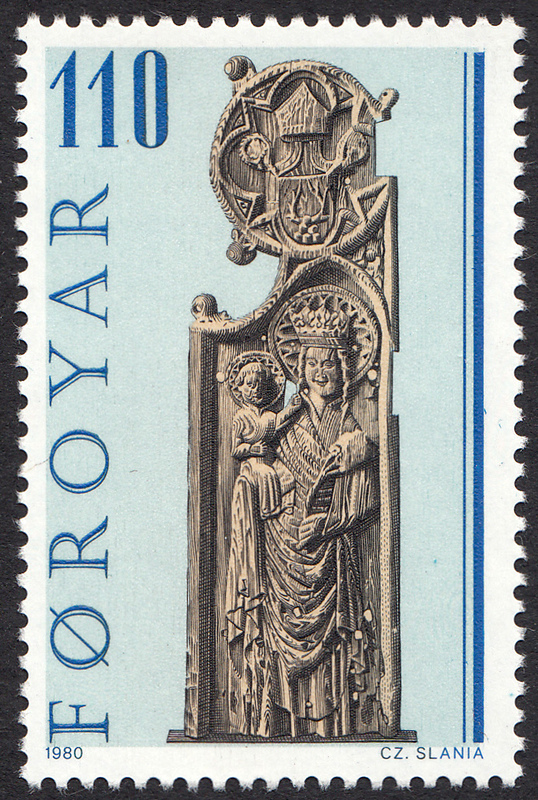 These pew ends are such fine pieces of art that the Faroe Islands Postal Authority decided to celebrate their beauty by featuring them on a set of stamps. Czeslaw Slania was picked to do the engravings. 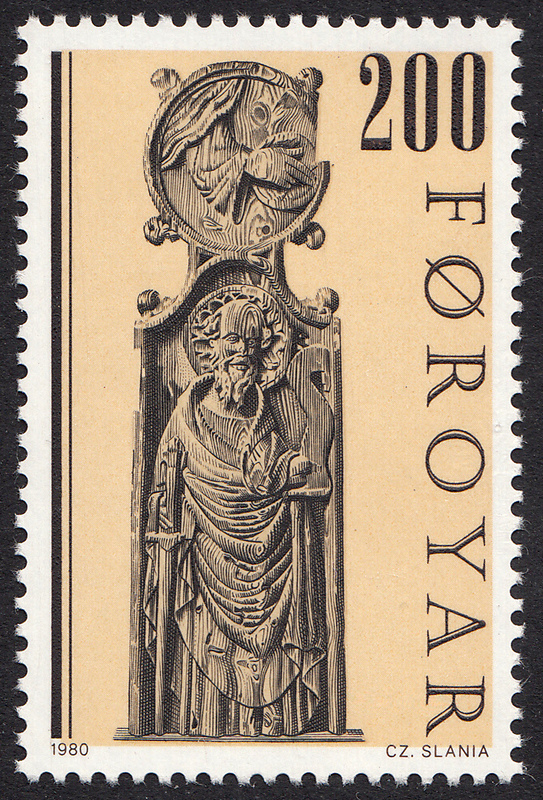 There were four stamps initially printed, and these were issued on 8 October 1980. 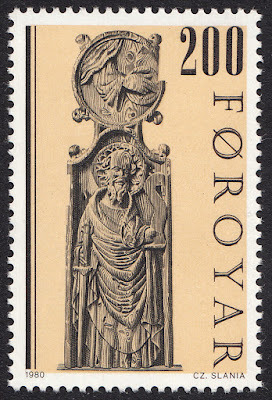 Two subsequent sets of four were issued in 1984 and 2001. In this blog I will focus on the first set of four issued in 1980. The first pew end carving depicts Mary and the baby Jesus. Not surprisingly, Slania has managed to capture the intricate details of the wooden carving as only a master engraver can. Studying a close-up of Mary and baby Jesus, we can see that Slania remained faithful to the original piece of art, even down to its irregularities. 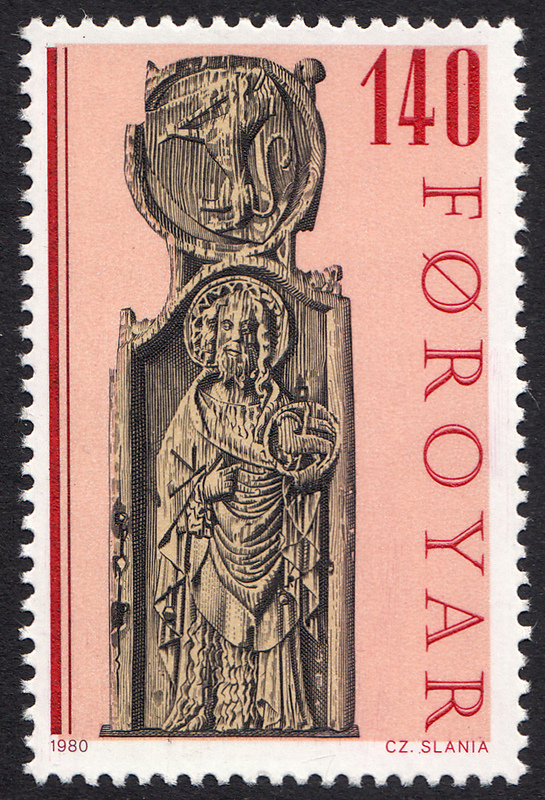 The second stamp in the series depicts the carved image of St. John the Baptist. 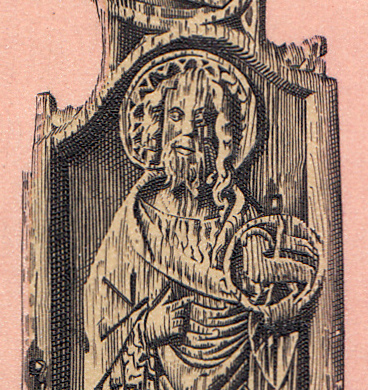 A close-up of St. John the Baptist. I love the halo. 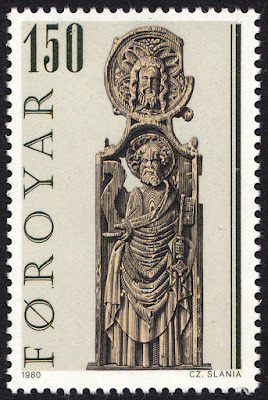 The third stamp in the series depicts St. Peter. This pew end has the addition of the face of Jesus above St. Peter. 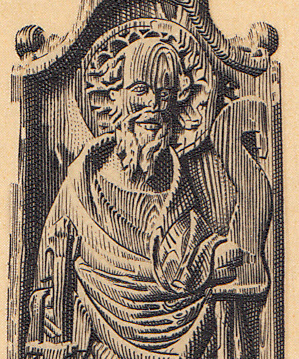 Close-ups of St. Peter and Jesus. 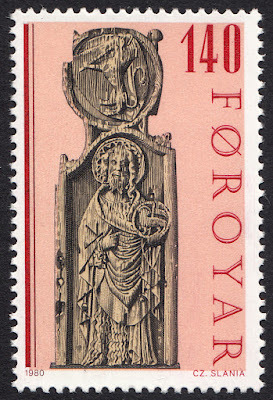 The final stamp in this series depicts the carving of St. Paul. A close-up of St. Paul. The detail Slania has achieved on each and every one of these stamps is truly exquisite. My only criticism of the set is the choice of background colours of the first two stamps. I personally don't like the colours at all. But that is just my preference. Very interesting. I am waiting for next sets of Faroes pews. According to Facit catalogue this set was issued on 8 October 1980. Second set was issued on 30 January 1984. 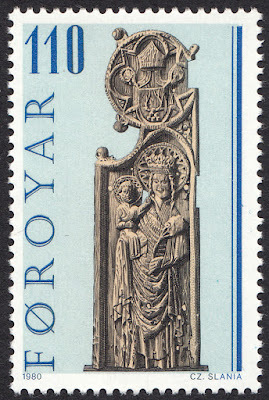 Third set was issued on 12 February 2001. These pews are magnificent, making the stamps of the carvings truly amazing.